Never did I imagine all the wonders that would come my way--new friends, new experiences, a great hobby and of course the devotion that is felt between a Skye and owner. It truly is "Heaven on Earth." To introduce this wonderful breed to potential owners--without denying the special skills it takes to live with a Skye, by sharing my personal experiences as a first time owner. 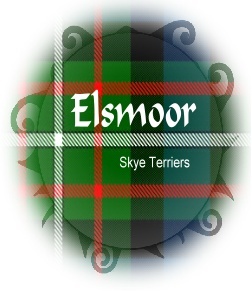 Is a Skye Terrier right for you? Please do your research! I will try to provide basic knowledge and personal observances of the Skye, but I am not an "expert." Learn all you can by accessing the links provided on the following pages, contacting breeders, reading books and visiting dog shows. To contact us please send inquiries to julie@elsmoor.com.